Christian Mate Pulisic (born September 18, 1998) is an American professional football player who plays as an attacking midfielder or a winger for German club Borussia Dortmund (BVB) and the United States national team. Considered by many to be the top American football prospect, Pulisic is the youngest player to represent the US senior national team in a FIFA World Cup qualifier. His rapid rise with the U.S. youth national teams has been mirrored by his rapid rise through the Borussia Dortmund academy, where Pulisic played just 15 games before being brought into the first team during the 2015–16 winter break. In April 2016, Pulisic became the youngest foreigner to score a goal in the Bundesliga. Later that month, Pulisic became the youngest player ever to score two goals in the Bundesliga. On May 28, 2016, a few days before his eighteenth birthday, he scored in an international friendly against Bolivia to become the youngest player in the modern era to score a goal for the United States. On September 2, 2016, Pulisic became the youngest American player to score a goal in World Cup qualifying history at 17 years, 349 days. He was born in Hershey, Pennsylvania, where he spent the majority of his childhood. His parents, Mark and Kelley Pulisic, both played collegiate soccer at George Mason University and his father also played professional indoor soccer for the Harrisburg Heat in the 1990s and later became a coach at both youth and professional levels. Pulisic lived in England for a year at the age of seven, playing for the youth team of Brackley Town. When his father was general manager of indoor club Detroit Ignition in the mid-2000s, Pulisic lived in Michigan and played for Michigan Rush. After the family returned to the Hershey area, Pulisic grew up playing for local U.S. Soccer Development Academy club PA Classics and occasionally training with local professional club Harrisburg City Islanders, now known as Penn FC, during his teen years. Pulisic’s grandfather, Mate Pulišić, was born in Croatia on the island of Olib. Pulisic applied for Croatian citizenship after moving to Germany (and the European Union) in order to avoid having to apply for a German work visa. Pulisic got an offer to play for the Croatia national team, but declined to do so. He has a cousin, Will Pulisic, who has also represented the United States at the under-17 level, as a goalkeeper. In March 2016, he announced that he too would be moving to Borussia Dortmund. In February 2015, Borussia Dortmund signed 16-year-old Pulisic and assigned him first to their U17 squad and in Summer 2015 to the U19. After scoring 10 and assisting 8 in just 15 games with the Dortmund youth teams, Pulisic was called to join the first team over winter break. In January 2016, while with the first team in the winter break, he played the second half of two friendly matches, scoring one goal and assisting another. On January 24, a day after making his debut on the first team bench, Pulisic played 90 minutes in a friendly against Union Berlin, scoring a goal and assisting another. Pulisic made his Bundesliga debut in a 2–0 win against FC Ingolstadt on January 30, 2016, coming on as a second-half substitute for Adrián Ramos. On February 18, Pulisic made his UEFA Europa League debut as a second-half substitute in a 2–0 victory against FC Porto. Pulisic made his first Bundesliga start on February 21, against Bayer Leverkusen before eventually being substituted for Marco Reus. He made his second Bundesliga start on April 10, against FC Schalke 04 in the Revierderby, playing 73 minutes before being replaced by İlkay Gündoğan. In response to Pulisic’s performance against Schalke, team manager Thomas Tuchel said, “He’s a teenager in his first year of professional football. His first two games in the starting eleven were in Leverkusen and here today in Schalke – not the easiest of tasks. It shows our huge appreciation that we see him as a full time player on our team. Pulisic was a valuable substitute against Werder Bremen and Liverpool. Pulisic has looked really good recently which has been proved today. 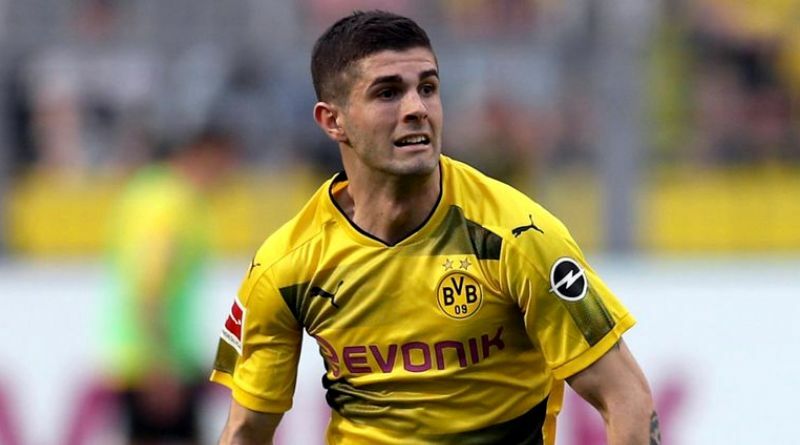 It is completely normal that he could not have played with this pace and this intensity for over 90 minutes.” Pulisic scored his first Bundesliga goal for Borussia Dortmund on April 17, opening the scoring in a 3–0 home win against Hamburger SV. It made him the youngest non-German and fourth-youngest player to score a goal in the Bundesliga, at just 17 years and 212 days old. With his goal against VfB Stuttgart on April 23, Pulisic broke another Bundesliga scoring record by becoming the youngest player to score two goals in the top-flight league. The game also marked his first yellow card in the Bundesliga, as a result of a challenge on Emiliano Insúa. In the 2016 International Champions Cup friendly pre-season tournament, he scored in stoppage time against Manchester City to send the clubs into penalties. During his first competitive appearance in his second year with the club, Pulisic became Dortmund’s youngest player ever to play in the UEFA Champions League. The following weekend he scored his first goal of the season and provided two assists in a 6–0 victory against Darmstadt 98, one day before his 18th birthday. In a September Champions League group stage game against Real Madrid, with Dortmund trailing 2–1, Pulisic came on as a second-half substitute and helped set up André Schürrle’s late goal, allowing Dortmund to earn a 2–2 draw. In a substitute appearance on October 22, Pulisic assisted one goal and scored the equalizer against FC Ingolstadt, who were last place at the beginning of the day, to salvage a draw, coming back from 3–1 down. Pulisic signed a new deal with Dortmund which will keep him at the club until 2020. On March 8, 2017, Pulisic scored his first UEFA Champions League goal in a 4–0 victory over Benfica in the round of 16, making him BVB’s youngest ever scorer in the competition at the age of 18 years, 5 months, and 18 days. Pulisic also assisted one of Pierre-Emerick Aubameyang’s goal in the win, advancing Dortmund to the quarter-finals. On August 5, 2017, he scored the first goal in the DFL-Supercup against Bayern Munich. However, the match finished 2–2 in regulation, with Bayern Munich winning on penalties. Pulisic has represented the United States at the U-15 and U-17 levels. Pulisic captained the U.S. U-17 national team at the 2015 U17 World Cup in Chile, where he had a goal and an assist in three games. He scored 20 goals in 34 games with the U17’s during his two-year cycle with the team. On March 27, 2016, Pulisic was called up to the Senior team by coach Jürgen Klinsmann ahead of a 2018 FIFA World Cup qualifying game against Guatemala. Two days later, he made his debut in that match, a 4–0 win at the Mapfre Stadium in Columbus, Ohio, as an 81st-minute substitute for Graham Zusi. He became the youngest American to play a World Cup qualifier. Before appearing in that match, Pulisic had been eligible to play internationally for Croatia. Pulisic was included on May 21, 2016 in the squad for the United States’ hosting of the Copa América Centenario. A week later, Pulisic became the youngest player to score for the United States in the modern era, when he put home a late goal in a 4–0 friendly win against visiting Bolivia. On September 2, 2016, Pulisic recorded two goals and an assist in a 2018 FIFA World Cup qualification match in a 6–0 victory over Saint Vincent and the Grenadines, becoming the youngest person to score in a World Cup Qualifier for the U.S. and the youngest player ever to score a brace in U.S. history. In the following match against Trinidad and Tobago, he became the youngest American to start a World Cup Qualifier match. On June 8, 2017, Pulisic scored both goals in a 2–0 World Cup qualification victory over Trinidad and Tobago. In the last two matches of 2018 World Cup Qualification, Pulisic scored a goal in each match in a 4–0 victory over Panama and a 1–2 defeat to Trinidad and Tobago to finish the fifth round as the top scorer with five goals. Despite this, the United States failed to qualify for the 2018 FIFA World Cup. He is a modern-day number 10. His low center of gravity allows him to dribble at high speeds. Recently, Pulisic has played more of a winger role for Dortmund. His adept weak foot skills allow him to play on either side of the field. Because of his style of play Pulisic is known to be a subject of fouls by opponents.